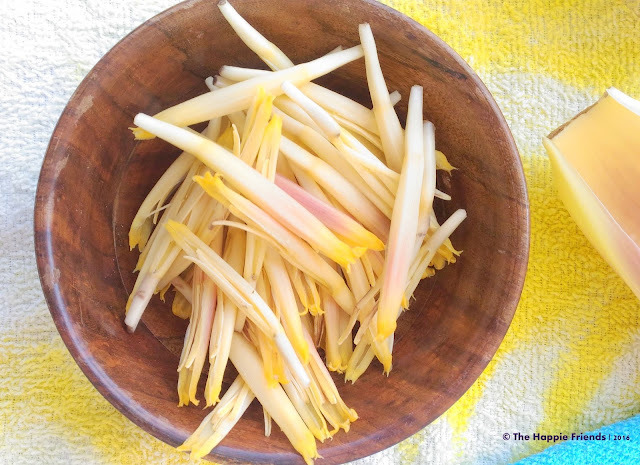 Banana flowers are loaded with fibre, protein, potassium, calcium, copper, phosphorus, iron, magnesium and Vitamin E. The flowers can be cooked in a numerous ways. It can be used in Salads, Soups, curry, Gravy and many more. 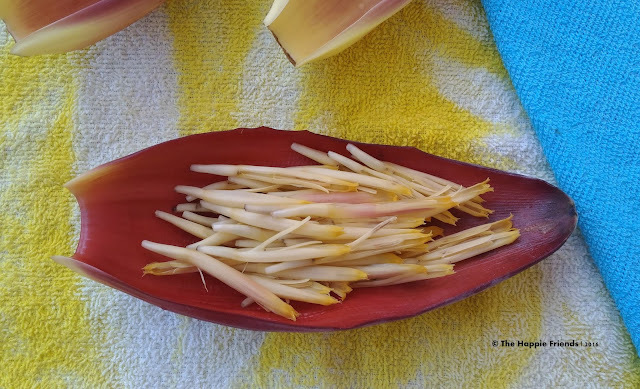 However when it comes to cleaning the flower it is pretty time consuming, we will have to sit patiently and clean it J So today let me take you through how to clean banana flowers with step by step pictorial representation. 1. Spread a mat or use a newspaper as the banana might cause stains and grease your hands with oil before you start to clean in order to avoid blackening in the hands, Take a Banana flower and remove the Petals. Inside each petal there will be the edible florets collect everything .Continue to do this by removing all the banana petals. 2. Take one floret and as shown in the image remove the transparent skin and the long part with a bud in the top and save the remaining .continue this process and collect the edible part. 3. If you are not going to cook the same day then you can save the edible part in a zip lock bag and refrigerate otherwise in a large bowl add in 2 cups of water and 1 cup of butter milk and whisk well. 4. Chop the edible part of the banana flower finely and keep them immersed in the buttermilk keep it refrigerated and use it when needed this avoids blackening of the flower. Always use a newspaper while cleaning the banana flower to prevent from banana stains. Grease your hands with oil to avoid the blackening in hands. Never keep the Banana flower in Fridge for more than 3 days as it might tend to get bitter. Soaking the chopped flowers in butter milk allow it to stay fresh. You can clean the Banana flower the previous night and use it for cooking in the next day. While cleaning the banana flower the innermost part will be while bulb/cone alike part, you can consume it raw as it has high medicinal values and good for stomach. Have never seen banana flowers over here...how fascinating! Very good informative post. Big thumbs up. Thanks for sharing.